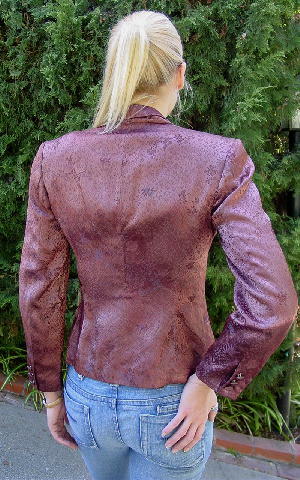 This golden brown evening jacket has shoulder pads and long sleeves with 3 fabric covered buttons. 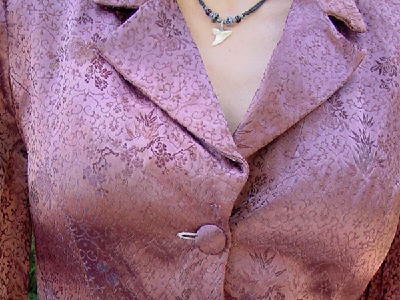 There are 3 larger fabric covered buttons down the front and 2 lower slash pockets which are still sewn shut. 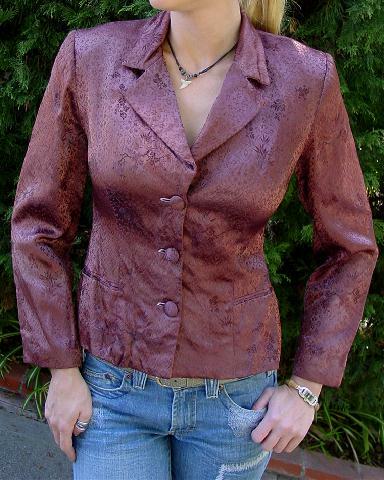 There is 1 large and 1 small extra button sewn on the lining. It's by BC BG Max Azria and is 100% rayon. There is a tone-on-tone vine and flower design. The actress wears a 4 petite. shoulder to shoulder 16 1/8"
bottom hem side to side 18 1/2"
armpit to armpit 18 1/8"